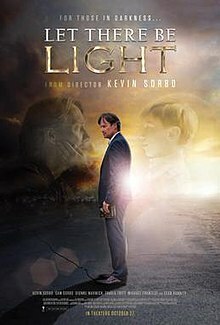 Let There Be Light is a 2017 American Christian drama film directed by and starring Kevin Sorbo and written by Dan Gordon and Sam Sorbo. The plot follows an atheist who goes through a near-death experience in an auto accident and converts to Christianity. Sean Hannity executive produced and appears in the film. Dionne Warwick and Travis Tritt also have roles in the film. It was released in the United States on October 27, 2017. Outspoken atheist Dr. Sol Harkens is having a debate with a Christian leader. After Harkens is considered to have won the debate, he attends a party for his book. He double fists cocktails while trying to get his girlfriend to come home with him that night; she refuses. Disappointed, Harkens heads home in a drunken haze to sleep it off. On the way home, his publicist calls him to arrange more parties to increase his exposure. Since he was already drunk after leaving his party and continues to drink on the way home, he veers off and crashes into a construction site. Suddenly surrounded by a carnival-like light tunnel, he sees hallucinations of his young son David, who died a few years prior from cancer. His son enthusiastically claims that he is alright and he should let God's love fill him, proclaiming "Let there be light!" as Dr. Harkens comes out of unconsciousness. After being clinically dead for 4 minutes, he awakens to find his Christian ex-wife at his side, and tells her that he saw their son. His doctor diagnoses his visions as merely adrenal brain surges that are caused in times of trauma. Harkens continues to struggle with his crisis of science versus faith. After his ex-wife shows up at his house to check on him, he decides to go and talk to pastor and former mob member Vinny at a church. After hearing the resurrection story, he has an epiphany and is baptized again as a believing Christian. After multiple visits from his ex-wife, he decides to rekindle their relationship for each other so they can be a family again with their two surviving sons. Shortly after proposing again and accepting, his soon-to-be-again wife Katy comes down with cancer, which is past the point of treatment. The film was released in the United States on October 27, 2017. Over its opening weekend the film made $1.9 million from 373 theaters (a per-theater average of $5,071), finishing 11th at the box office. In its second weekend the film was added to 269 theaters and dropped just 1.9% to $1.7 million, finishing 10th at the box office. On review aggregator website Rotten Tomatoes, the film has an approval rating of 50% based on 6 reviews, with an average rating of 4.6/10. ^ Tom Trento, interviewer (October 25, 2017). "DAN GORDON INTERVIEW - SCREENWRITER - "LET THERE BE LIGHT"". YouTube channel The United West. Retrieved October 27, 2017. ^ a b "Let There be Light (2017)". Box Office Mojo. Retrieved December 20, 2017. ^ Judge, Mark (August 30, 2016). "'Let There Be Light': Upcoming Kevin Sorbo Film on Conversion of 'World's Greatest Atheist". CNSNews.com. Retrieved November 7, 2017. ^ Goldstein, Gary (October 27, 2017). "Review: Sean Hannity and Kevin Sorbo join forces in the Christian reckoning drama 'Let There Be Light'". Los Angeles Times. Tronc. Retrieved October 27, 2017. ^ Harvey, Dennis (October 23, 2017). "Film Review: 'Let There Be Light'". Variety. Penske Media Corporation. Retrieved October 27, 2017. ^ Brian Brooks. "The Square' Runs Circles Over Most Openers; Weinstein's 'Amityville' Bombs – Specialty Box Office". Deadline Hollywood. Retrieved October 29, 2017. ^ Anthony D'Alessandro. "'Thor: Ragnarok' Flexes His Box Office Muscles To $120M-$122M Opening – Early Sunday AM Update". Deadline Hollywood. Retrieved November 5, 2017. ^ "Let There Be Light (2017)". Rotten Tomatoes. Retrieved March 14, 2018. This page was last edited on 4 October 2018, at 18:23 (UTC).